Paddling in the wilderness where help could be days away should not be taken lightly. To be as safe as possible, it takes much more attentiveness and preparedness than paddling on a familiar roadside run. Extra care needs to be taken not only on the water but while scouting and hiking too. What are you going to do with a broken leg...or a broken wrist? Even a sprained ankle can turn in to an ordeal. You should also pick your paddling partners with the same amount of caution. It is best to paddle with people whom you’re comfortable with both in and out of the water. Not only will you be around them 24 hours a day, your life may depend on them. Always be looking for trouble... not to get into it, but to stay out of it. Tommy & Matt discussing emergency escape routes at the put-in. Doing this could mean the difference between a strenuous all day hike & a multi-day epic. everyone on the trip to familiarize themselves with the river canyon and adjacent topography via topo maps* and Google Earth. Make note of all major geographical points, distances, tributaries, trails and roads in case there’s a problem forcing someone to hike out. You should basically be looking for escape routes. Being familiar with the general terrain will also make it easier to make time/distance correlations for picking campsites, etc. Besides the pre-trip study, I recommend taking a map too. They weigh little and take up even less space. *Delorme and National Geographic both have good topo software. Delorme Topo USA and Google Earth make an incredibly useful combination. An absolute minimum for any one should be a class in basic first aid technique and CPR. 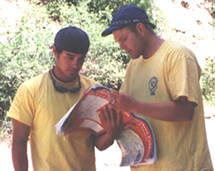 A comprehensive wilderness first aid course is highly advisable. Once you take these courses and study a few books, you should have a good idea what you’ll need in your first aid kit. Whether your kit is homemade or commercial, the contents should always be adjusted according to trip duration, special hazards, the particular group, location and so on. To save weight and space, do not carry anything that you or your group doesn’t know how to use. Have the groups most competent paddler carry the kit and keep it easily accessible in a separate dry container (i.e. Nalgene bottle) or bag. Thinking of carrying a CPR face shield? For quicker access (and time is of the essence here), carry it in your PFD pocket, not in the first aid kit. Using the heimlich to save drowning victims gets high praise from some. I am not recommending the heimlich in lieu of CPR for drowning...but, it may have its place, in certain circumstances. You do the research and make that call. Although it should never be expected of some one to risk their life for you, it’s comforting to know that your partners have rescue knowledge. They would probably appreciate the same of you. With a good PFD, all of this can be carried on person, where it is easily and quickly accessed. The throw bag and sling can be worn on your waist. See below. PeakUK River Guide PFD with whistle tethered to shoulder (shoulder padding removed); Pentax Optio W20 top right; Kershaw Leek SpeedSafe knife with serrated blade & traction tape added to handle, tethered to PFD; Oregon folding pruning saw; two Petzl Ultralegeres pulleys; fire starting kit in waterproof bottle; Mini Bic with duct tape; CPR face shield; two biners; 9' of 1" tubular webbing sling with biner, worn around waist; Salamander Golden Retriever worn around waist, upper left; two prussiks, lower left. 50' of rope is the absolute bare minimun on even the smallest of creeks. Longer ropes are better. A decent way of going about it is wearing a 50'er on your waist and hauling a regular throw bag inside the boat of equal or greater length. A waist worn bag will save space in the boat plus it’ll always be there when you need it. From geniune experience, I have come to put high value on having a rope on person at all times. Beware that some waist worn bags are prone to coming loose, potentially causing entanglement. Check yours and your groups often....while floating, on portages, breaks, etc. For quickest access, wear a sheathed knife on your PFD. Otherwise, keep a knife inside your PFD pocket. It will not catch on things while inside. I prefer Kershaw Speed Safe knifes as they are the easiest and fastest to open folding knifes I am aware of. Some function with the same ease and speed as a switchblade. Do not use a rescue PFD without proper instruction and practice. Leave your neoprene socks at home and wear real shoes inside your boat. You are a liability to both yourself and your buddies without proper footware. When worn around the waist, a tubular webbing sling (see blue webbing in pic above) is an extremely versatile piece of gear that's easy and quick to don and doff. A few uses are: Anchor point for z-drags, vector pulls, etc; dragging your boat; pulling boat up steep/vertical pitches; lowering boat down steep/vertical pitches; immobilizing dislocated shoulders; sit harness; and what ever else your imagination comes up with. Wear it like a belt with a carabiner acting as the buckle. To minimize snagging hazards, adjust the length so it's snug when wrapped around twice. You and your group must be able to extricate yourselves from every imaginable predicament so plan accordingly. Boat Repair: Always carry materials for patching a cracked boat. My preference is Tear-Aid (Type A) backed-up with Gorilla tape. A friend squeezed a season of NF Payette paddling from a cracked kayak using nothing but Tear-Aid. In this pic, two cracks (6" & 2") were covered with Tear-Aid on the inside then Gorilla tape inside & out. 60 more miles of rocky paddling. No problem! There are other methods/materials. Just make sure your chosen is proven! Simple is good. Regardless, it is critical to drill a small hole at each end of the crack to arrest crack enlargement. Tip of a small knife works. Think ~1/16" diameter. One of the nice things about kayaking is that it’s an individualist sport. However, prior to getting on the water, it’s a good idea to work out a plan to move more efficiently and safely down stream. No one wants to hike/climb out of a remote wilderness canyon...especially one with no trail. But, it can happen any where to any one. Being prepared can make your life a whole lot easier...or even save it. If you are lucky, your hike may begin near the put-in or take-out and only require minimal effort. If not so lucky, you may have a multi-day trek to look forward to. Depending on the conditions and or circumstances, you may very well have to leave your boat behind and retrieve later. At any rate, if at all possible, you'll want to get yourself and equipment out under your or your groups own power. Calling upon the authorities, or other outside help where the media could get involved, should only be done as a last resort. Remember. This is SELF-support. Shoes: worthy of redundancy. Refer here. Orientation: do you know where the easiest escape route is...river right or left, how far above the canyon, etc? Refer to "Maps." What to pack out and what to leave? Assuming you have not lost your boat, ideally, you should pack every thing out right then. It's not often that this is a practical option though. In these cases, take no more than what the circumstances call for. Just stash the rest and retrieve ASAP. Water: dehydration robs energy, causes dizziness and headaches, and reduces the ability to concentrate and think rationally...all things you do not want at a time like this. In extreme cases, dehydration will even lead to death. 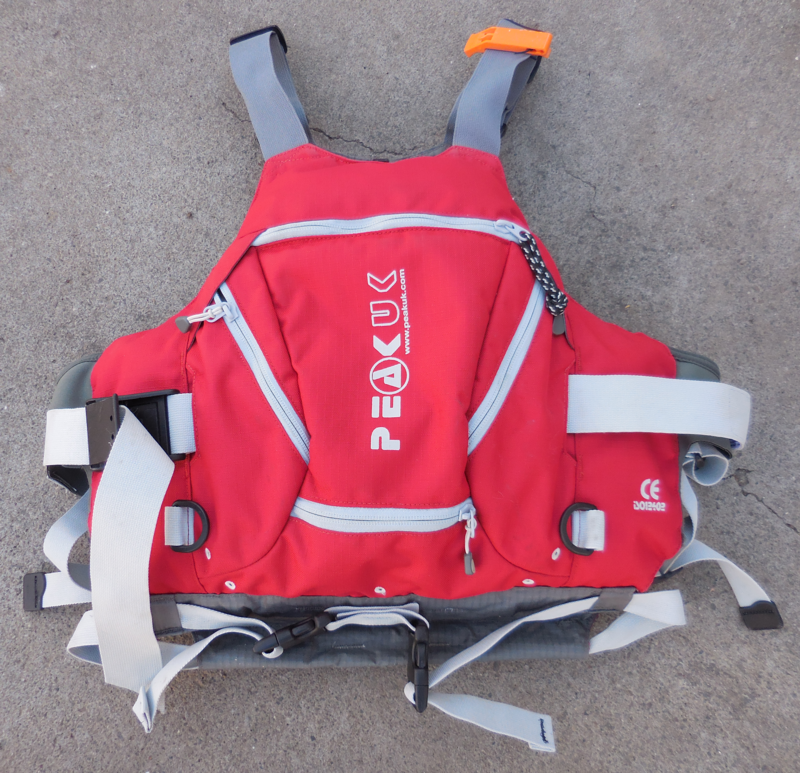 carry a packable reservoir, like this, in your PFD pocket. If you lose everything, you'll still have a way to pack water. Even if you don't lose your boat with your water bottle, in some cases, you will need/want more capacity than what your bottle has. This is particularly important when traveling in the desert. If extra capacity is needed (i.e. desert regions w/ greater walking distances), one can put water in a drybag/drybags and rig a carrying system. If more than one is hiking out, each person can take turns packing it. I've done this. It works but the water tastes bad and nasty stuff is almost certainly leached into the water. Fire: warmth, signaling or to keep bugs at bay. Always carry at least two fire starting implements in your PFD. Lost boat, no problem. I carry a lighter and flint. 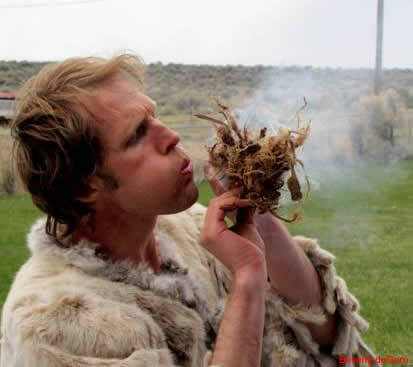 Fire starting material will make your life a lot easier when you are tired, hungry and cold. I like birthday candles and cotton balls saturated in Vaseline. Pulled apart a bit, one ball like this will burn for nealy 5 minutes. Candles are easy to light and burn a long time. Starting a fire with a lit candle is often times easier than with a lighter, and it saves fuel in your lighter. 2-3 candles, 1 flint stick (requires practice) and a half dozen cotton balls will fit in a standard pill vial (see photo at right). Keep this in your PFD pocket. Be able to start a fire in any condition at any time. Practice at home if you can't. Also, being able to start a fire with nothing but sticks is a big plus. If nothing else, you can wow your friends at camp while car camping! Food: this isn't an absoute nessecity but just a little can give you a good energy and much welcomed morale boost. Food will also help you sleep better if you get stuck out. If only one has to hike out due to a lost boat, share food with that person. Actually, always carrying a bar inside your PFD or drysuit/drytop pocket is a good habit to get in to. You will likely be walking through, by and over various wild edibles. Learning to identify these food sources will make your life a lot easier. In extreme cases, it could even save it. Signaling: if need be, you can grab the attention of others from miles away by simply using the sun. While a "signal mirror" is ideal, just about any shiny, reflective, and polished item could work: Tin foil, inside of an energy bar wrapper, aluminum can, polished stainless steel knife blade, etc. Like every thing else in this section, carry the signal device on person in a secure pocket. Getting out of the canyon is only part of the challenge. With nothing as far as the eye can see and an injured knee, these paddlers are in for a different kind of self-support. An all too often overlooked aspect to safety is the colors one chooses. If you need new gear, whether it be boat or apparel, please, do yourself and buddies a favor and buy bright. Paddling, pinned, swimming, scouting, etc... the gray, black and similarly dull and dark colors so prevalent in todays market are difficult to see and are nothing more than camouflage in the river environment, a fact amplified in low light canyons. Yellows and bright oranges are the most visible (see pic below). While better than dark and dull colors, red, often perceived as a safety color, is not the best choice as it has a narrow lateral range for visual periphery. A four year study concluded that yellow fire trucks are safer than red fire trucks which, prompted the FAA and many community agencies to convert rescue and fire-fighting fleets to lime-yellow. Read more about the study of safety colors here and here. No self-respecting kayaker would be without duct-tape. Its uses are endless from first aid to repair & fabrication. Wrap it around several things such as your paddle shaft, lighter, pill vial, water bottle, etc...or place strips inside your kayak. Several widths come in handy too. Be seen when you most need it & get the brightest color you can. If your colors are dull and or dark, and you do not need new gear, tape can be used to brighten a few things. Yellow electrical tape wrapped around a paddle shaft can add visibility as well as grip. Just the same, a strip or two of yellow duct tape can brighten dark helmets and be used for a multitude of other things...if the need arises. Double duty. Get creative! Any time you get out of your boat, solidly wedge it in rocks, brush or trees. I don't know how many times I have seen or heard of boats sliding or getting knocked into the water because they were carelessly placed. In one such incident, the self-supporter whose boat slipped in to the river broke his wrist while walking downstream to find it. Place your paddle just as carefully...and, out of harms way. Often times, boats tend to get stacked above drops being scouted. No need to have your paddle under three loaded kayaks. Stick it in the bushes where it won't get boats piled on it or stepped on. Never carry non-locking carabiners in exposed areas such as on your sprayskit, PFD, or boat. One individual had a paddle biner clipped to his skirt that clipped to his paddle during a hole ride... resulting in a popped skirt, followed by swim with paddle attached...on the NF Payette. In another instance of weirdness, a paddler popped out of his boat only to realize the biner he had clipped to the deck had attached itself to his skirt grab loop. These oddities serve as good reminders that strange poop can and does happen...when you least want them. Color me bright! A good example of bright colors that will show up in practically any environment whether paddler is in or out of the boat, on land or in/under the water. Orange helmet with reflective stickers & strips on straps, yellow drysuit & waist worn throwbag, PFD with reflective logos, orange boat, & yellow electrical tape on paddle. Get bright. Be seen. Find your gear. Be safe! Protect yourself. According to a revered Alaskan bush pilot/kayaking friend (not in pic), there have been a number of deaths & serious injuries sustained in backcountry plane crashes that a helmet could have prevented. Statistically, there's an 84% higher survivability rate when wearing a helmet. His advice to all plane shuttling kayakers: Wear your helmet. He dons an aviation helmet on every flight. While at it, don your PFD for additional impact protection. You have nothing to lose! Watch a backcountry crash caught on tape here. Lunch date? 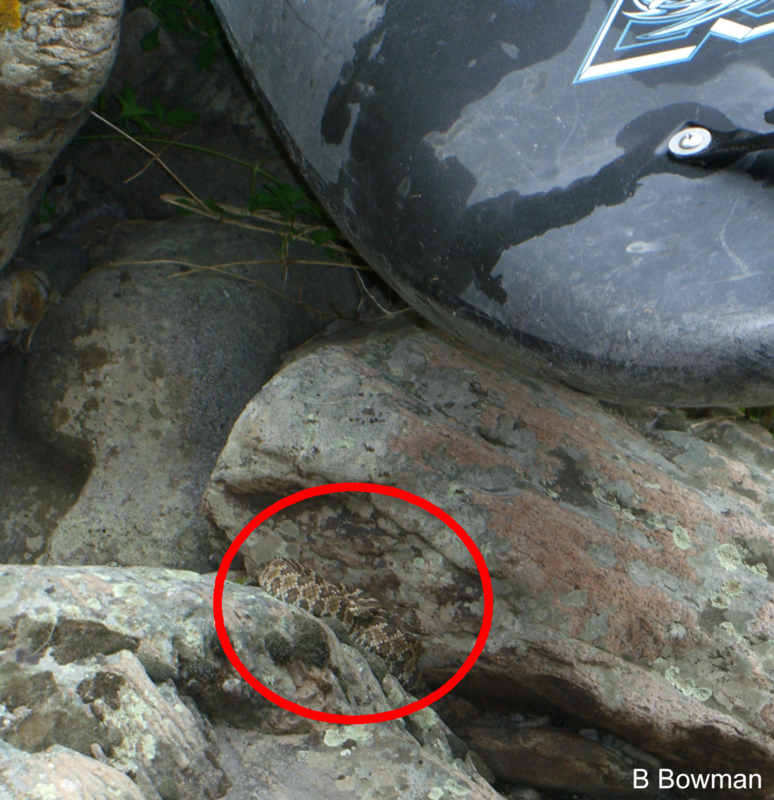 Unbeknowning to what he sat his boat over, the kayaker ate half his lunch before noticing this rattlesnake sitting near him. Rather than fleeing like rattlesnakes prefer, this one likely felt threatened by the boat & decided to take a stance. The paddler didn’t hear the rattling due to the river noise & hearing loss. This was a poignant reminder that we need to be aware of the rattlesnakes' existence & take necessary precautions. There’s no need to kill them though. Forget the Hollywood drama. Be watchful, & give them their space. If you do that, they'll gladly give you yours. Hantavirus anyone? Be careful to not stir up dust in old cabins, caves or overhangs and think twice before sleeping in one. Though rare, Hantavirus is a serious and infectious respiratory disease with a U.S. mortality rate of 38 percent. And contrary to popular belief, Hantavirus is not primarily confined to the Four Corners area. Every western state has reported cases and more than half of all cases have come from outside the Four Corners region. For more information, visit the Center for Disease Control (CDC) website. Whenever the story of a solo trip into the wild goes public, particularly one involving a mishap, even if very minor... it is predictable as nightfall the soloist will be chastised. The Internet is a haven for armchair critics looking for a story to pounce on, giving anyone that dares to go alone a public lashing. "Stupid" and "idiot" they proclaim. Ironically, these same fault-finders typically have no experience in the activity the soloist is participating in. However, it's not uncommon for the criticisms to come from within the very community the soloist is from. More common than condemnation from within the circle though, is a certain adoration that soloing garners... particularly from the extreme sport community where the act is sometimes glorified. Having been doing things by myself for as long as memory serves...a practice born from circumstances and other factors including the remote sheep ranching environments I was raised in, I'm no stranger to being alone in distant areas. Before giving it much thought, I had already done much kayaking and backpacking alone...something I started at the age of 12 with my first solo overnighter. Back then, I wasn't familiar with any labeling of the practice. And it wasn't known to me to be a big deal either way. It simply was what it was in a ranching culture where being self-reliant was a way of life. As the Internet became a fixture though, I began seeing a wider cross section of society. I saw that going alone was a big deal to others, whether lampooned or esteemed. Amused yet befuddled, pondering these different views proved to be a real eye opener for me. As my dad would delight in hearing, it allowed me to see how incredibly privileged I was to have been raised in the environments and manner I was. Placing myself in the shoes of those with urban upbringings and more "normal" backgrounds, I began to understand the raised brows. From there, it got complex...considering what soloing had become at the hands of commercialized outdoor recreation and, more specifically, the impact Youtube, GoPros, and social media has had on societies behavior. In short, these technologies tend to lure people to engage in types of behavior they wouldn't otherwise... including soloing. The power of such enticement draws in varying degrees of personalities, and ultimately, different levels of competency. That said, while I don't necessarily condone the lambasting, it is of little wonder that some get into trouble when alone. When behavior is recognition oriented, it becomes easy to overlook any lack of experience, and the fact the risks are greater for some than others. Regardless though. At the end of the day, one thing remains the same for all: It is almost always riskier going alone than it is with a group. All that said, spending time alone in wild places is great for self-discovery and spiritual development. Naturally, it also cultivates a keener environmental and spatial awareness, independence, and confidence. In short, solo wilderness experiences are an opportunity for tremendous personal growth. As such, they are increasingly being facilitated by psychotherapists, educators, counselors, and outdoor adventure leaders around the world. In aboriginal cultures, solo journeys were a rite of passage. Christ, Immanuel Kant, and Confucius also understood the value. The great American naturalists Thoreau, Muir, and Emerson advocated it. Why then is solo wilderness travel so often frowned upon? The answer is complex and beyond the scope of this page. However, I believe the gist goes something like this: Along the way of pursuing the American dream, we gave up skills that made us self-reliant and confident and replaced them with considerable anxiety of being alone in the wild. To a great extent, most modern people have figuratively and literally become disconnected from the natural world, seeing it instead through the narrow lens of technological fiction. Consequently, the unknown has become a thing of fear, and that of which was very routine a century ago (or in my case, 40 years ago), is now considered dangerous and foolish. Given we are a different people than those of the past... present day prescribers of solo wilderness time are not typically advocating aboriginal style journeys. And they are definitely not encouraging people to cram themselves into tiny plastic boats and crash through rapids in inaccessible and remote canyons. For those with the mental and physical wherewithal though...assuming they can break free of the ego's grasp... the values seen in the less risky solo endeavors can be amplified and extended to another level when self-supporting. However, there's no mistaking that this very niche method of travel carries considerable more risks than hiking or backpacking alone. And the closer one gets to the line in which their personal skill level is challenged, the more they are risking. I understand the risks of soloing in remote places, and do everything in my power to minimize them. Even with a lifetime of experience though, to err is human, and I accept that and the things beyond my control, for such is life. Based on popular opinion, it would be easy to conclude that going solo is not wise. Common human logic supports this in the sense that there is indeed safety in numbers. However, when the topic of traveling solo comes up, it is often forgotten, or not even considered, that the level of extra risk varies from person to person. For example: Many living contemporary lifestyles today have developed a psychological or physcial reliance on others which makes them uncomfortable being alone in remote areas. Others tend to get into trouble more often than their peers, where ever they may be. Either type of person would automatically be more at risk soloing than the self-reliant individual who grew up in the outdoors and had a long track record of making sound decisions. It’s no different than every other aspect in life. Depending on one's upbringing, background, state of presence, and natural characteristics... some people are simply more adept at certain things than others. What may be extremely foolish for one may be very reasonable for another. These points in mind, if soloing is not our cup of tea, we should be careful not to judge those we do not know well who do choose to go alone. They may have the independent character to make it a choice well within reason. If you think you're cut out for solo self-support, you should have already contemplated the many “what ifs”. Hope for the best.... but methodically and thoroughly plan for the worst. One must be able to identify trouble in order to circumvent it. When that fails, the art is in the recovery. What is your level of artistry? Obviously, being pinned and unable to free oneself is the solo paddler’s worst nightmare. Nothing more needs to be said here. Less dire but dreaded nonetheless, is incurring an injury to an upper extremity and/or losing a boat. In either case, you’ll be hoofing it...or arranging a rescue via a satellite communications device (see photo at bottom). Another and even worse possibility is an injury to the back or lower extremity preventing you from walking OR paddling. Would you know how to handle these situations? What’s your track record on and off the river? Are you vigilant? How’s your overall physical conditioning? What about your sense of direction? Can you climb? Could you walk 10, 20 or more miles crosscountry, through extremely rugged terrain with no trail? Some things to ponder. Be honest with yourself. Lastly, paddling in groups tends to cause a degree of complancency in all of us. To what ever degree it is, we should recognize it and adjust accordingly. This awareness needs to be acute in solo backcountry situations. If we give our 100% to mindfullness, there will be no room for carelessness. Below are a few pre-trip and on-the-river reminders for solo paddling. Without assistance, even the smallest mishap can lead to disaster... and in the worst case scenario, there will be no witnesses. A PFD with plenty of pockets is nice anywhere but of real value for self-support & a must for soloing. Between its four well placed pockets, this PeakUK River Guide has room for a sizable "survival kit" yet is still legitimately comfortable with no large protrusions in front. PFD kit: In addition to what's shown here: 2 liter packable reservoir in dry enviroments; several energy bars (inside of wrapper can serve as signal device); mini headlamp; & cuben fiber poncho/bag/shelter. First & Foremost: Consider your motivations for going solo. If you could not enjoy yourself and experience personal growth with no one knowing that your trip occured, it is time for self-reflection. Again. Be honest with yourself. An authentic trip will have more meaning and be less likely to cloud your judgement. If you have considerable experience paddling alone on day runs successfully, and solo self-support appeals to you yet you lack the confidence, try solo backpacking. You can then reevaluate your desire to self-support alone. Go slow. There is no destination to race towards. It's the beginning of a very personal journey. Paddle at least a full grade below your skill level...particularly if you're new to soloing. If you can paddle class 5, start out with nothing more difficult than class 4...or better yet, class 3-4...if you're comfortable in the other aspects of being alone in remote and inacessable areas. However, if your upper limits is class 3, you may want to stick to nothing more than class 1+. Many would argue that no one without the skills and expeience to confidently paddle class 5 should solo. I would not argue with that. However, it boils down to the individual. Some crash down class 5 who'd do well to practice hard moves on class 3. Others have excellent class 5 skills yet do not paddle anything more difficult than class 4. The latter is far less likely to get into trouble and is someone who would garner more respect and trust, on and off the water. Write down a detailed plan A, B, C, etc and give it to at least one trustworthy person that knows your abilities in and out of the water. Do not deviate from those plans. Also, explain your gear (what you carry & colors) and how you would use it (signal device, strobe light, etc) in an emergency so others know what to look for and expect. 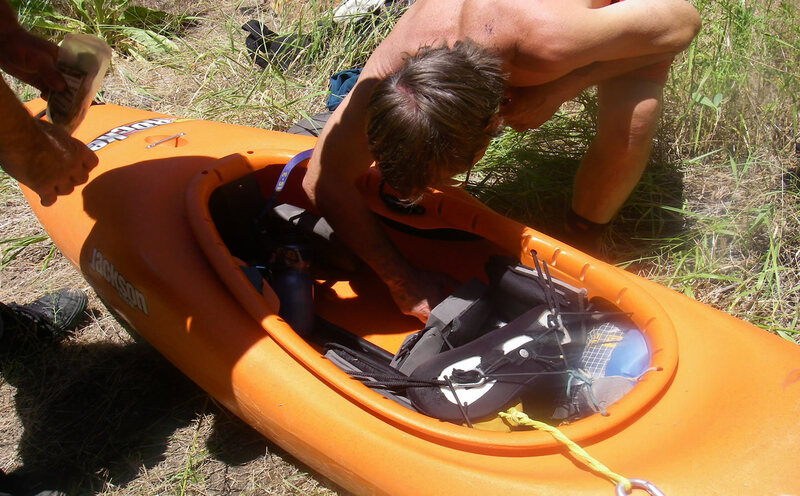 Carrying gear retrieval equipment on person is as wise as carrying a breakdown paddle in your boat. One solo self-supporter I know used to carry a "pin kit" in a bag strapped to the back of his PFD, and on at least one occasion, used it. That works but a more streamlined method is to use a PFD with built-in pockets (less of a snagging hazard) containing enough volume to accommodate this gear as well as the other things you might want for a long hike out if that's what you have to do. Space can be saved by wearing a waist worn throw bag with spectra rope, using Petzl Ultralegere pulleys, etc, etc. Read the above section "Hiking out" and have plenty of secure pockets to carry necessities in. Remember though. The most important necessity is carried within your cranium. Technology has created a cultural mindset that believes its advances will fix every woe...an idea so entrenched in our minds that we fail to see this very thought process creates the trouble we seek to solve. Rather than making corrections through lifestyle changes, we look towards technology. With it, we fix one problem while unwittingly creating two new issues. Through a mix of arrogance and ignorance, we are outsmarting ourselves in a cycle of irony... more than we realize, and more than we want to admit. That said, though these devices are often times used and abused in the same manner, I'd be amiss if I didn't mention this piece of technology. 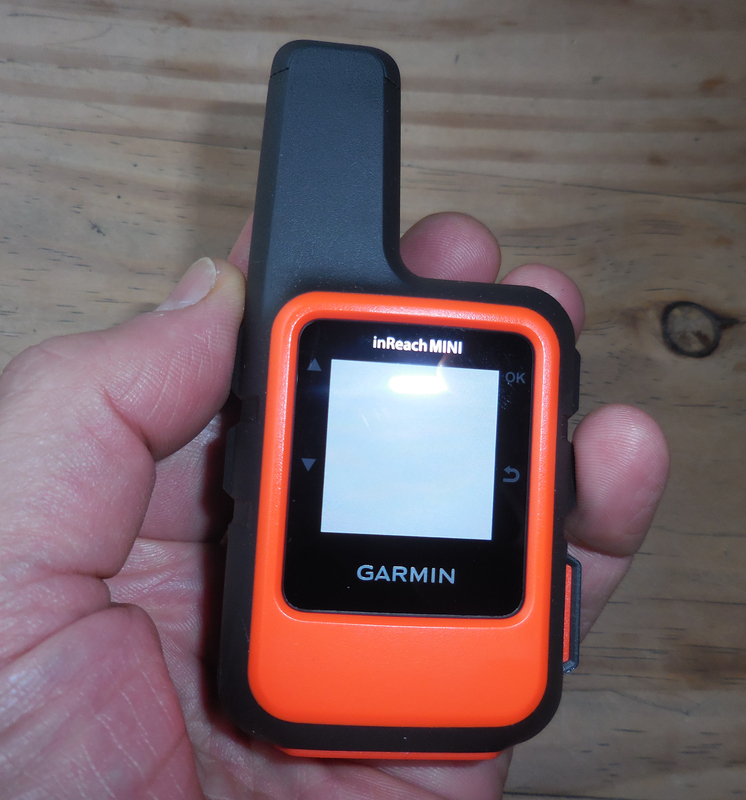 Carried on person, a two-way satellite communication device, like this Garmin inReach Mini, will not only allow one to send an SOS in a life or death situation, one can coordinate their own rescue in less dire situations. They can be a real life saver, figuratively and literally. Please, though. Do not rely on these devices to compensate for lack of experience, planning, or judgement. Rid youself of any notion that a mistake is an option. At the same time,understand that accidents can and do happen. Prepare yourself by running though your head every conceivable scenario. Be cognizant of boat placement (see "general tips" below). Also, if you decide to stop for a hike, consider clipping your kayak to a tree in case a microburst comes through. Rare, yes, but I have seen a boat 50 yards from the water's edge get blown into the river. Consider also a bear looking for food knocking your boat into the river or ripping through your drybags. Tie your boat off like those of the old west tied their horses....and hang your drybags, if in bear country. There's no such thing as overkill when soloing. Exit your boat carefully in the easiest place to get out you can find. In one careless moment at a less than ideal eddy, I some how managed to get my leg twisted and foot hung-up in my boat that, without help, would have resulted in a twisted ankle, swim, lost boat, or all of the above. Most kayaking injuries occur out of the water. Place each step with awareness and forethought. Notice the sounds made by your footsteps. This is a very meditative way of moving and can be applied to everyday life, conditioning one to become more aware of their surroundings. Unless you can see a clear route to another escape eddy, NEVER place yourself in an eddy you can not exit your boat from. Slowly and methodically work your way downstream, running only that of which you can see a clear route through. Scout more than you think you need to. There is no shame in this or portaging drops you wouldn't think twice about paddling with a group on a roadside run. The choice to solo is yours and yours alone. I am not recommending or suggesting solo travel of any kind to anyone. The risks may involve serious injury or death. The decision to accept that is entirely your own. This page, and the section on "soloing" in particular, is to serve for entertainment and discussional purposes only. I shall have no liability or responsibility to any person with respect to personal harm, death, or property damage caused indirectly or directly by any material found on this page or any other pages in earthenexposure.com. If you do choose to solo, remember this: You have a moral responsibility not only to your friends and family, but to the community, paddling and otherwise. Those who choose not to solo also have a responsibility. The death or injury of a soloist inevitably paves the way to the breeding grounds of speculation, and without a great deal of care, only brings further misunderstanding and harm. Either way, tread wisely. © Earthen Exposure 2018. No part of this page may be reproduced or copied without the written permission of Earthen Exposure.